Killing termites is easy, and if you haven’t disturbed them badly during your discovery, this information will assist you. Read the chapter “Killing Termite Colonies”. Do-it-yourselfers can purchase a product containing chlorfluazuron which is the same as is used by professionals. It has been in use for more than a decade and is still used because it does the job. 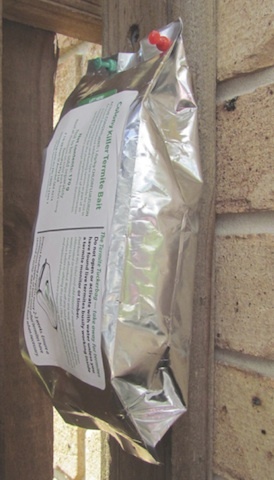 A registered bait that is available for unrestricted sale to homeowners is Colony Killer Termite Bait by online sale. This is approved for homeowner use and does not need to carry “poison” or other statutory warnings because it is an insect growth regulator. This means anyone can buy and use it. It is used to feed termites in monitors or to feed termites inside timber structures. This bait is not suitable for controlling Mastotermes, the Great Northern Termite. You can easily identify them: they are 13-15mm long, (that’s more than half an inch) and their distribution is generally North of the Tropic of Capricorn. There is more information on Mastos in The Book on Termites. 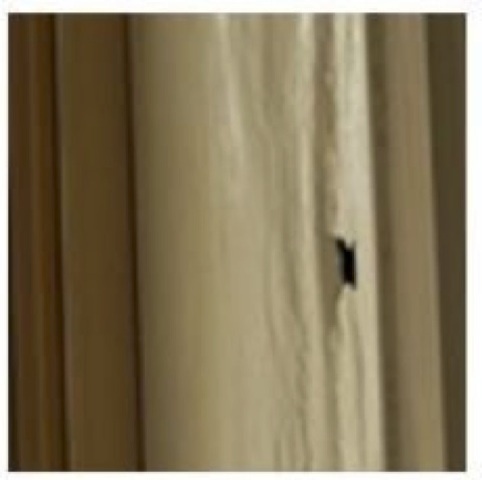 If you have found termites in timbers such as the window/door frames, skirting boards inside, or in studs, posts, roof and foundation timbers of any structure, you need to make a small hole into the timber, actually see live termites then add a light-proof cache of the bait covering the hole in the timber. Make an opening into the termites using a pointed knife or fine screwdriver. The hole should be no bigger than about 5mm diameter to begin with. (It can be enlarged when it is time to add the cache of bait). You can pry into the surface of the timber where it feels spongy, thin or hollow. You can also pick away at any of the ‘mud’ they use to fill up joints cracks or splits in the timber. It is only as a last resort you should attempt to open a tunnel on a timber or foundation surface. Once you have broken through into where it is hollow, wait for a minute or so. If termites are there, the soldiers usually come to guard the opening while workers repair it. You will see their antennae and their heads blocking the hole. If no live termites appear, leave the hole open and come back later or check next day. If they are still using the timber, the hole will have been repaired and this confirms they are ready to be fed the bait. If the timber has a flat surface, make the hole away from corners so you can line it up with the hole in the bottom of the pouch of bait. 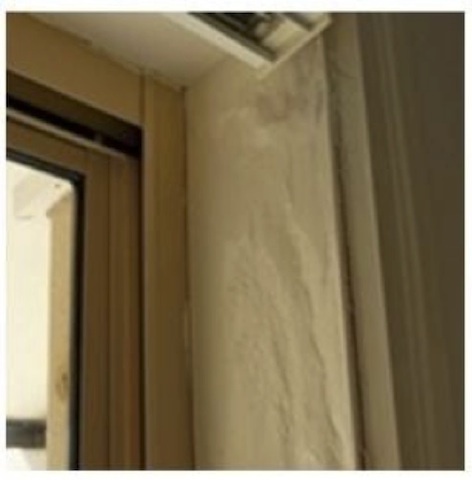 If the access hole to the termites is on a round post or another situation where the surface is uneven, the flexible pouch will mould into the uneven surface to seal out light and prevent humidity loss as the workers then have direct access into the cache. This pouch is fixed to a gatepost and a couple of tacks are used to help support the weight rather than risking the adhesive being insufficient. 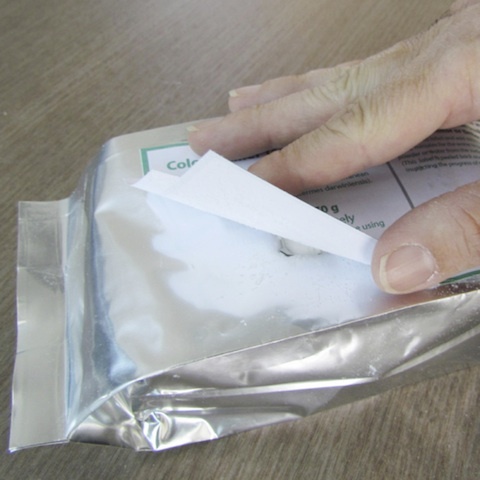 The foil pouch has a removable/replaceable label as in kitchen wipes to allow inspection of the feeding progress. Chlorfluazuron inhibits the production of chitin which is the hard outer shell of insects. It is also known as an Insect Growth Regulator (IGR). The effect is on the nymphs in the nursery area surrounding the queen in a subterranean nest. The nymphs cannot produce the new shell they need to grow to the next stage and they die… thousands of them. The decomposition gases and the resulting fungi make the nest uninhabitable. The queen dies and the workers and soldiers out in the food areas survive for only a few more weeks. You can be more confident of a successful kill using the baiting/feeding method than the dusting or foam introduction methods. There can be another reason (which also applies for the feeding procedure): if anyone does weeding or landscaping or in some other way accidentally severs the underground connection tunnel back to the nest—there won’t be any termites visible in the galleries, but it’s not because the nest is dead.